Eiko Grim­berg gives a lec­ture with images and foot­notes on Itali­an Mod­ern­ism and Ration­al­ism based on a build­ing which also appears in his artist book ‘Future His­tory’. 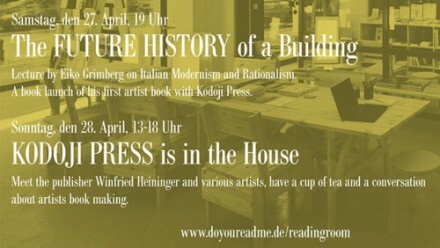 April 28th from 1 to 6pm — Kodoji @ Read­ing RoomA wide range of dif­fer­ent titles, rare books and edi­tions are on view to browse and to pur­chase. Talk to the pub­lish­er and vari­ous artists to get close stor­ies about dif­fer­ent artist­ic approaches of mak­ing an artists book.